Which roof style is best for your outdoor space – gable, hip, flat or shed? 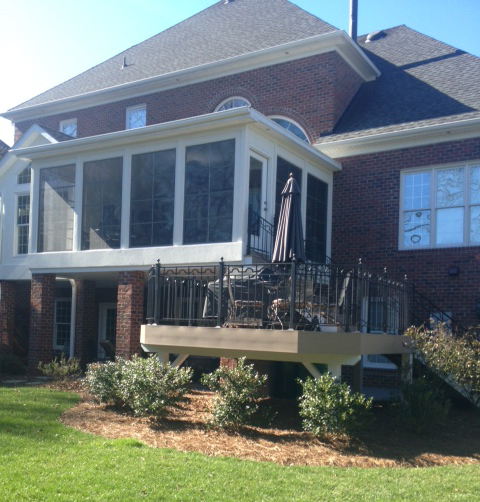 Archadeck of The Piedmont Triad proves that all roof styles are not created equal. What works for one outdoor structure doesn’t always work for another. We can help you decide which roof style would work best for your individual circumstances. 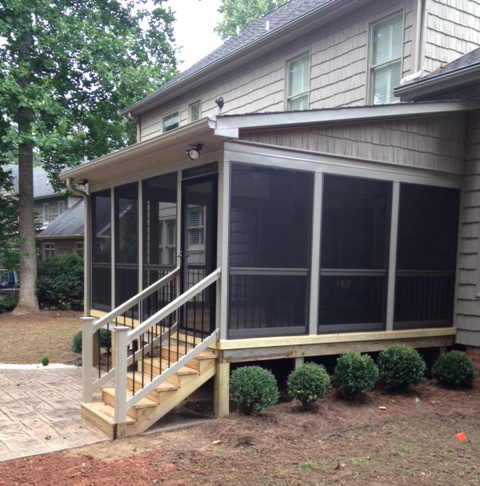 This Greensboro, NC screen porch features a gable roof. When you make the decision to add an outdoor living space that requires a roof, the style of roof you choose is an important decision. There are many factors that should go into choosing the roof that works best for your home. The first factor is whether the new roof will tie into the roof of your existing home. Another important factor is the location of your structure in conjunction with your existing home or other structures that are located on your property. In many cases, the roof style simply comes down to personal preference. No matter what your circumstances are, learning which roof style will work best for your outdoor space will ensure that your new addition looks like it was made to fit with your home. This photo shows the interior of the same 3 season room as shown above. The vaulted ceiling gives the space an open feel. The most commonly used roof styles in outdoor living design are the gable, shed, hip and flat roof. A gable roof is the one that looks like it triangle. A good deal of light enters your room when the gable (or triangle end) is open. This roof style creates an open and airy effect. 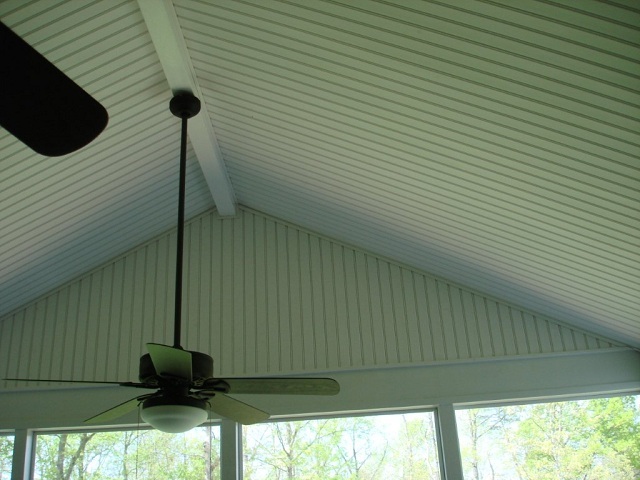 Hip roofs are also a popular choice among homeowners in the Piedmont Triad area. A hip roof has 3 or 4 sides that descent from one point. The popularity of hip roofs is in part because many of today’s homes have hip roofs. Archadeck of the Piedmont Triad always reviews your home’s roof style(s) in helping determine which roof style will work best on your outdoor space. Another roof style which use makes sense in certain situations is a shed roof. A shed roof slopes downward from the house connection. Shed roofs are simple in nature and work great with a tie-in to one-story home needing a low roof connection. Having architectural elements and upstairs windows that won’t allow a roof or certain roofs would cover or cause view obstructions also make great candidates for shed roofs. Flat roofs can also make a viable option where the situation calls for a roof style that will not intrude on structural or design elements. Notice how this roof style makes the perfect fit for the architecture and window placement of the existing home. One misconception we would like to address is the idea that a flat roof is just that – flat. Flat roof styles are not completely flat. Archadeck of the Piedmont Triad always designs a flat roof with a slight incline. The incline prevents pooling of water on the roof itself which can lead to structural problems in the future. 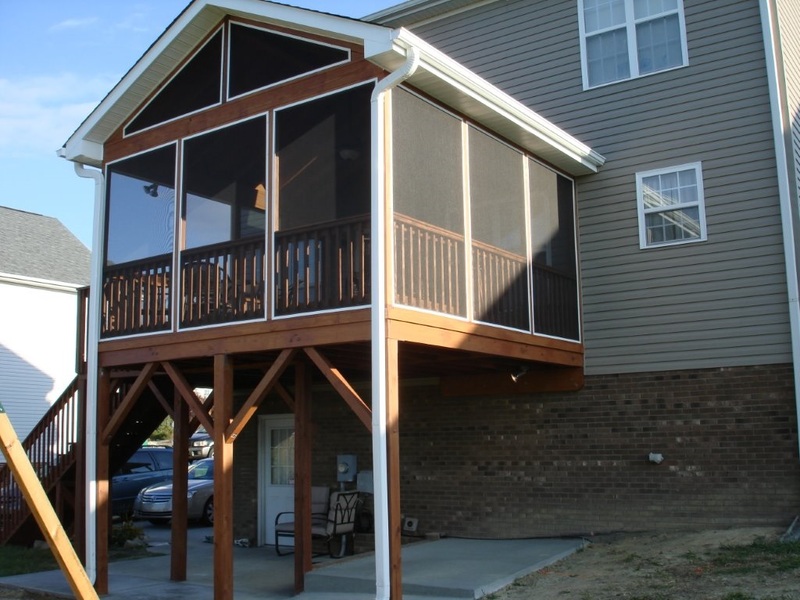 To see more examples of roof styles that will help you decide the perfect fit for your outdoor oasis visit our screened porch gallery, and our 3 and 4 season room gallery located on our website. This entry was posted in Choosing the perect roof style for your outdoor room, outdoor rooms and tagged 3-season rooms, Archadeck of the Piedmont Triad, Choosing the right roof style for your Greensboro NC outdoor room, Choosing the right roof style for your Winson Salem NC outdoor room, design consultation, Greensboro NC gable roof screened porches, Greensboro NC hip roof outdoor rooms, Greensboro NC porch roof styles, Hip roofs, outdoor living area, Piedmont Triad gable roofed outdoor rooms, screened porches, Shed and flat roofs on outdoor spaces, sunrooms, The importance of building an outdoor space conducive to the size and scope of your home and property, The important of choosing the right roof style for your Piedmont Triad outdoor space, Which roof style is best for your Greensboro NC outdoor space - gable, Which roof style is best for your Winston Salem NC outdoor space - gable, Winstom Salem NC gable roof screened porches, Winston Salem NC hip roof outdoor rooms, Winston Salem NC porch roof styles. Bookmark the permalink.